In 2010 at the age of 49, Warren was at the peak of health and fitness, far beyond that expected of a man his age. 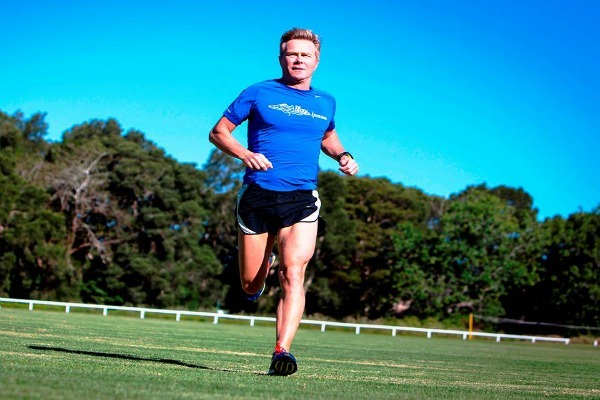 Working solidly at two distinctly different and demanding careers as well as competing as an elite Masters Athlete, a random check up with his GP revealed a life threatening cardiac condition. Having experienced no symptoms, this came as a major shock and baffled the doctors. After several months of experimental cardiac drug therapy and medical procedures, he found himself struggling to function. Facing work on a daily basis was difficult and running had become virtually impossible. After heading out on a Sunday morning run with his training squad, Warren suddenly felt breathless, fatigued and faint. He knew his current treatment was seriously putting his life in danger, and he sought the help of a new cardiologist who immediately stopped treatment with the experimental drugs and suggested that Warren look at an urgent and radical form of treatment, the implantation of a Medtronic cardiac pacemaker. The story of his comeback, both emotionally and physically, is truly inspirational. Setting challenges and personal goals forged the road to an amazing rehabilitation. Within days he was back at work, within two weeks running and within a month he had competed in his first NSW Cross Country Championships. This was soon followed by an ‘age group’ victory in a major Australian road race and several other podium finishes from 5 kilometers to a half marathon. He accomplished all of this while resuming his successful teaching and entertainment careers. Warren was selected to compete in the TC10 Mile Championships in Minneapolis/St Paul, USA as a member of Medtronic’s “Global Heroes Team” in 2013. This team consists of 25 inspirational international runners who are supported by implanted medical devices. So impressed by his ability and strength of character, he was honored with an invitation to return in 2014 as the ‘Team Captain.’ In 2015 Warren again returned to Minneapolis/St Paul as the male Alumni Host for the 10th Anniversary Medtronic Global Heroes Program. Warren also competed in the 2014 and 2015 Stephen Siller “Tunnel to Towers” in New York City finishing 21st overall in 2014 and 23rd in 2015 taking out first place in his age group. The race traces the footsteps of heroic Brooklyn fire fighter Stephen Siller who tragically lost his life in the September 11 Attack. Warrens’ highly emotional recount of the event with more than 35,000 competitors, including several thousand Emergency Service and Military Personnel, is a reflection of profound courage, resilience and the human spirit. Now an ambassador for Medtronic and a mentor to other patients with similar conditions, Warren has travelled to the United States, Singapore, New Zealand and across Australia with his story of survival and courage. Warren Williams is also a devoted family man, teacher, multi-award winning entertainer, artist, athlete, coach and Australian Surf Lifesaver.